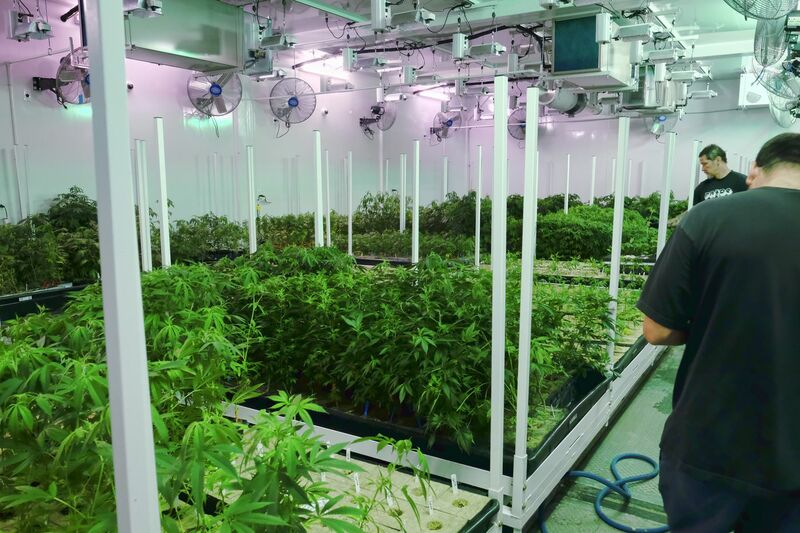 A grow room for medical marijuana in Los Angeles. New Jersey needs to think not only about big-business, but small home growers. As we consider marijuana legalization in New Jersey, the rights of everyday consumers should be at the forefront, and stay there. But the cannabis industry and out-of-state regulators have been hogging the table. Legalization means far more than a right to buy. It also means creating spaces for social use, ending workplace discrimination, clearing records, and importantly on the economic side, it means allowing people to cultivate their own plants. Growing a few seedlings in a small plot isn't for everyone. It takes time, dedication, and some know-how. Still, the option is critical to the concept of getting people to adopt a regulated atmosphere. That's why it was an unwelcome shock when New Jersey state Sen. Nicholas Scutari — who has been a leading voice on cannabis legalization for more than a decade — introduced a bill last month that left out many provisions that are critical to consumers, including home cultivation. The legislation, SB 3195, is a loose template of ideas that will need a lot of work to achieve some real-world goals. For instance, it would do nothing about New Jersey's particularly harsh prosecutorial practices that regularly send people to state prison, sometimes for a decade or longer, over fewer than 20 plants. Leaving the worst marijuana laws on the books will keep the dangerous game between small-scale growers and cops going at full-steam. Moreover, if New Jersey wants to reap the full economic benefits of legalization, we need the thousands of entry-level jobs in hydroponics, nutrients, lights, and gardening supplies that come with personal cultivation. What's odd is that Scutari (D., Union) used to be a strong advocate for green flower hobbyists. He had included such provisions in his original medical marijuana bill and in the last two versions of his full legalization bills. What changed? Scutari and other legislators visited Colorado and encountered the Department of Taxation and Revenue's marijuana division. Its director, Barbara Brohl, has been railing against the practice and she pushed for recent legislation to curtail plant amounts in the Centennial State. Colorado's issues shouldn't completely stop our residents from growing in the Garden State. We should be teaching other states a few lessons by tackling problems they haven't even touched yet. A big one is drug testing. Workplace screening for marijuana has barred consumers from good jobs. THC tests for everyone involved in a court case is a major burden on drug treatment resources. While states can't order businesses to stop drug testing, N.J. can change the practice for government employees — including police and firefighters. That shift could be a template for the private sector. When New Jersey legalizes cannabis (or perhaps even sooner), the state should immediately stop THC testing for those on pretrial, probation and parole. During the height of the opiate crisis, we cannot afford to waste a single treatment on people being tested as a bureaucratic formality who do not have legitimate addiction problems. Another significant concern for consumers is getting their records cleared. Scutari's bill includes some placeholder language about expungement, but the flood of such applications could seriously clog the courts. N.J. residents can already apply to expunge marijuana possession convictions, but it takes hiring a lawyer for $500 to $800. The state has reached record levels of cannabis arrests — about 25,000 per year. Hundreds of thousands with records need this relief. The process needs to be streamlined for marijuana, and courts need to process them en masse. It's not rocket science, California is doing the same right now. The stated goal of Scutari's bill — and, really, any legalization effort — is to end the illicit marijuana market. So far, no state has even come close to achieving that. New Jersey should innovate in this area. It's time to consider legitimizing the existing local, underground, small-scale growers and sellers. Small-quantity selling permits (1 lb. per month) with low application fees would get the weed gals/guys to go legit. They could purchase wholesale cannabis from the industrial, regulated cultivators and sell to local adults in their networks. Sales tracking and ID checks could be done through a secure smartphone app. Craft cultivator co-op permits could bring flower farmers out of the shadows. They could build a network of clients and fulfill orders akin to vegetable co-ops. This could also allow several growers to serve clients from a single space. New Jersey politicians foresee $300 million in new tax revenue from almost $1 billion in cannabis sales. Every penny would come directly from the pockets of us – the consumers. If elected officials really want all that cold cash, they should start warming up to the state's existing, underground consumer base. Addressing our concerns first is the fastest way to get marijuana consumers to actually "buy in" to a regulated market.